Many of you know about the Vitamin benefits and its role in the body. You also sometimes feel the requirement of some vitamins like vitamin A, E, D, and C to improve your overall health. There are certain vital things too, which you should be aware off when you plan to consume specific vitamin or a mineral. Let's look into some of the important fat soluble vitamins that can pose danger to health, as it is difficult to be excreted out of the body. Vitamin A is needed for night vision, immune system function, healthy growth etc. Vitamin A toxicity is known as hypervitaminosis A and may occur after taking excessive amounts of vitamin A for a long time. Symptoms of too much vitamin A include fatigue, suppressed appetite, nausea, dizziness, headache and dry skin. 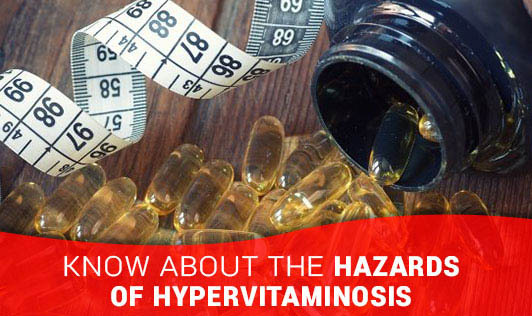 In severe cases, excess vitamin A may cause liver damage. Vitamin D is used for treating weak bones (osteoporosis), bone pain and bone loss in people with a condition called hyperparathyroidism. Vitamin D toxicity usually results from taking an excessive amount of vitamin D supplements and not from the diet or too much sun exposure. The main reason for vitamin D toxicity is due to buildup of calcium in your blood, causing symptoms like vomiting, frequent urination, weight loss, poor appetite, kidney problems, confusion etc. Vitamin E is used for treating and preventing diseases like cardio vascular problems, diabetes, skin, pregnancy etc. When excess of Vitamin E builds up in the body it can cause muscle weakness, nausea, fatigue, dizziness, diarrhea, blurred vision and risk of bleeding. Some research suggests that high doses might increase the chance of death and possibly cause other serious side effects. Vitamin K is an essential nutrient for the blood clotting and the healthy bone mineralization. Those with kidney, liver or heart disease or those taking certain synthetic forms of vitamin K may be at risk for side effects of excessive vitamin K consumption. Vitamin K intake may worsen bleeding in those with liver disease and interfere with dialysis in those with kidney disease. Make sure that any Vitamin supplements you consume should be only after the physicians' advice and also check with your Dietitians to avail their requirements from natural sources.